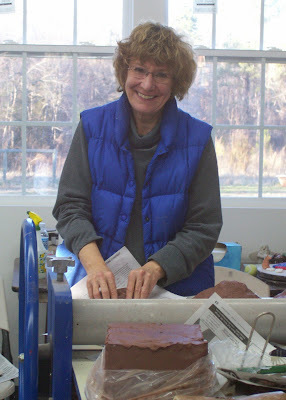 Cranked up the kiln this morning and will spend a few minutes (while it’s still quiet around here) learning more about blogging. 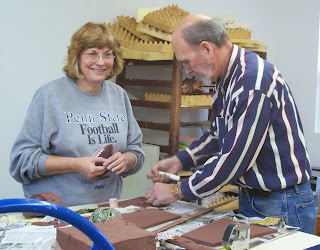 Here are some photos of Jackie & Mike and Suzanne & Tom, making their wonderful garden art. I think it was late January. The goal is to finish the pieces while their gardens are still going. What with all the busy schedules, we’ve had that much trouble connecting! Well, this has taken me a while and it is time to move on to other things. I’m probably missing something very simple, but the “Compose” window is so small, I’ve had a hard time moving images around. 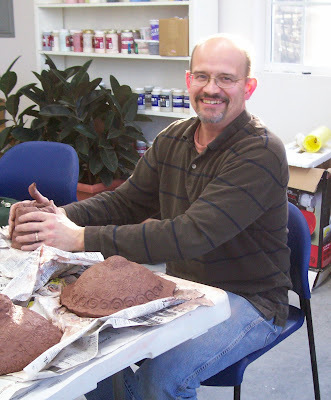 I’m pretty sure I’m better at teaching clay to other people than blogging to myself! 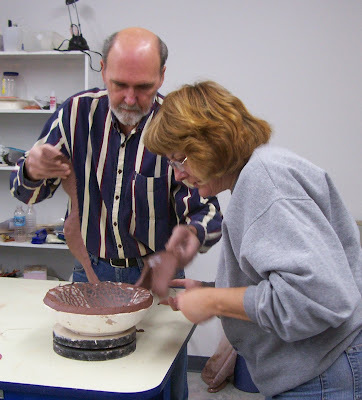 When I download them from my camera, I’ll post photos of Suzanne and Tom glazing–they made it a point to say the whole process was a lot of fun–more than people would expect. If you ever get bitten by the clay bug, you’ll see what they mean!